Replace your obsolete contact gauge with the latest non-contact laser thickness measurement technology. 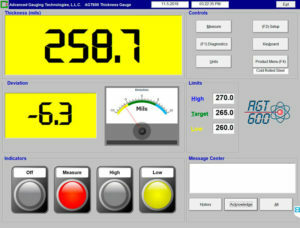 The AGT600 Thickness Industrial Laser Gauge is designed to be a direct replacement for current contact gauges. The C-frame is engineered to fit the existing track and can take advantage of the same motion control, hardware and programing with minimal downtime. The gauge has dedicated analog outputs for real-time thickness and deviation from target for closed loop process control feedback. The AGT600 Thickness Industrial is a non-contact laser thickness gauge and has no sensitive mechanical parts to produce an accurate and repeatable thickness measurement. Maintenance is simply keeping the sensor heads clean and the system calibrated. No more scheduled downtime for the maintenance or replacement of transducers, measurement tips, guide rolls, or suspension components. A simple touch screen provides instant thickness and deviation Information. Entered target thickness values and limits will provide digital outputs that can be used for QC lights and a visible indication on the screen. 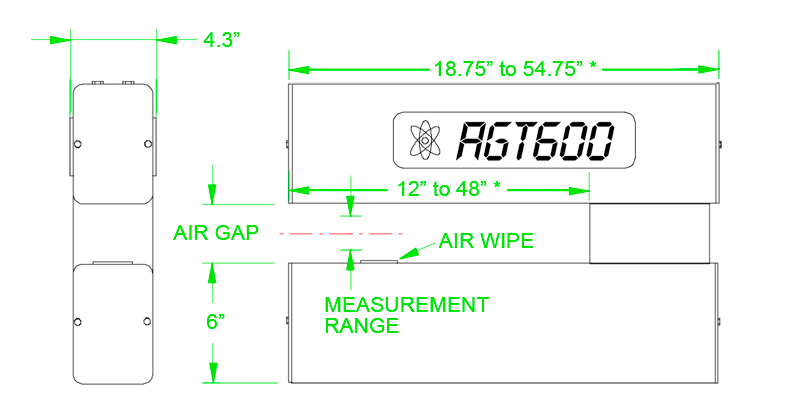 The AGT600 strip thickness gauge measure all kinds of metals, plastics, rubber, vinyl, linoleum and more. It provides fast and reliable thickness measurements using the latest in laser triangulation technology. Our specifications below reflect real-world accuracy and performance not laboratory conditions specified by some other companies. 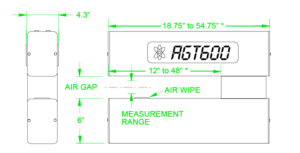 Our simplified hardware design combined with Keyence’s ultra high speed, high accuracy laser sensors make the AGT600 the most reliable laser gauge in the industry. A.G.T. will design a system to fit your application and installation is as easy as bolting the C-frame into place, mounting the junction box and running the cables through your existing cable carrier. 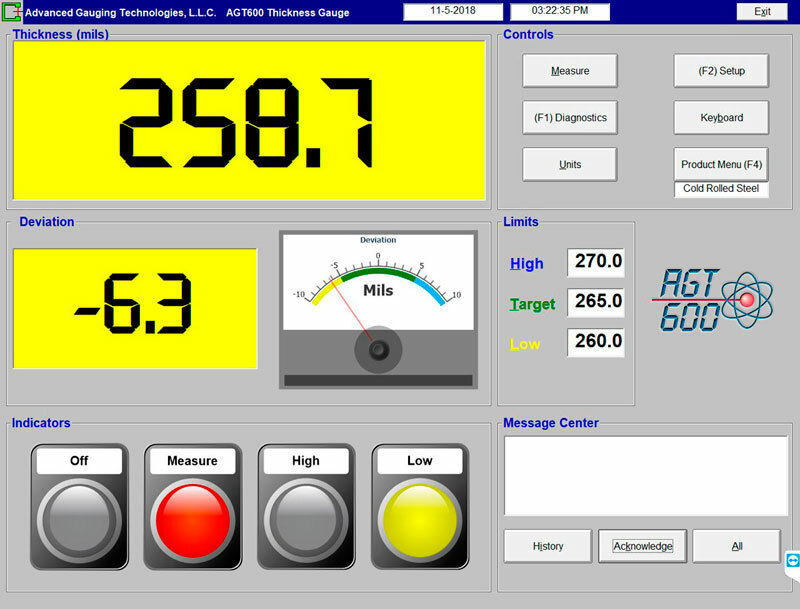 The touch screen interface can be mounted anywhere within 300 feet of the gauge. Our system features a fast and accurate calibration method, called ISOcal™ that establishes calibration over a range of samples and reports its calibration accuracy. Our calibration procedure uses N.I.S.T. certified and traceable aluminum samples. The AGT600™ is a non-contact measurement system, so there is never any risk of our equipment creating marks or scratches on your material. 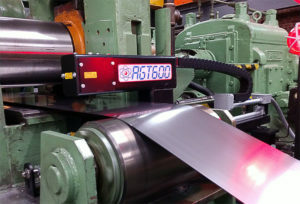 Gauging your strip at the entry of your roll forming line provides the highest resolution thickness data possible for your profiles. The AGT600’s compact design is an excellent fit for application or lines where space is limited. The AGT600 has a plug and play design. It can be permanently mounted on your line or can be mounted to a mobile stand to be moved from line to line. Two non-contact, high-precision, semiconductor laser sensors are mounted above and below the strip to be measured, and their beams are focused on the same spot on the target material. Each sensor emits a Class II laser beam, receives the beam back on a RS-CMOS pixel array and determines the distance or range to the target material, calculating the material thickness. The system is calibrated based on this data, allowing it to provide continuous, high-speed, non-contact, accurate and reliable thickness measurements. The N.I.S.T. traceable sample includes a set of six, 6061-T6-651 alloy aluminum — certified and traceable to N.I.S.T. standards. The custom calibration sample holder includes a black anodized finish.